Test your own powers of deduction with this giant box of brainteasers. 10. Studies show that you are never more than 3ft away from one. 9. They are an ancient mythological symbol for patience. 8. They have blue blood. 7. They do not have a skeleton. 6. They can jump up to 40 times their own body length. 5. Two nursery rhymes have been written about them. 4. They are ranked among the top 10 greatest fears. 3. A famous superhero is named after them. 2. They have eight eyes but very poor eyesight. 1. They secrete the strongest organic substance on earth. How long did it take you to figure out the answer? Were you seeing spiders at fact number ten, or did you need every fact to construct your web? Test your own powers of deduction, your ability to think on your feet, and your smarts with this giant box of brainteasers. Made to be played at home, on the road, or on a family vacation, this set-up-free game is chock-full of cards, each containing ten tantalizing clues that lead the player to just one correct answer. The opposing team or player draws a card and reads the ten clues one at a time (starting at the tenth one), giving the guesser just 10 seconds to answer before reading the next fact. Clues progress in order of difficulty, where each factoid is easier to decipher than the previous one read. Sure to challenge competitors of all ages, this fast-paced game puts the pressure on the guesser since the number of points received for a correct answer decreases as he or she progresses through the clues. The player or team with the most points wins! Created and developed by a team of young advertising and marketing professionals at ad agency L.A. Inc. in Toronto. Includes 200 cards. Made in China. For additional challenges and even more timely brainteasers, check out Kwizniac 2! 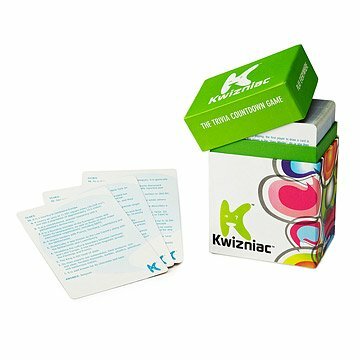 Keep inquisitive kiddos on their toes with Kwizniac for Kids! Check out our blog to see Kwizniac put to the Game Night test. Bought as a gift for a friend and loved it so much bought another one for our family. We play just us, my husband and I. We also play with our best friends as well as our family. So it's great for a variety of life situations. Also compact enough to travel in the car and go on vacations. I got both the chldren's and adult versions, in hopes the family can play together. This is so much fun for 2 players and we can't wait to try it out with even more! The puzzles are challenging but not impossible. We keep it on our coffee table for times when we're a little bored and it is a great way to pass the time. We do wish there was a way we could block the answer so that playing with 2 players we could each try to guess the same card. I got this for my brother and his wife for Christmas last year. It's a big hit because it's so simple and can be played any time, and you learn things at the same time. We have fun playing when we visit; hollering out random guesses. It's probably too difficult for kids, but our daughter (age 12) still has a fun time playing it with us as a family. Has been fun to play with family. We love that we can sit around in the living room and casually play as a family. I would probably purchase the second edition. The only con is that some of them are really too easy, and so guessing it in the first 1 or 2 clues kind of does away with the challange/fun.